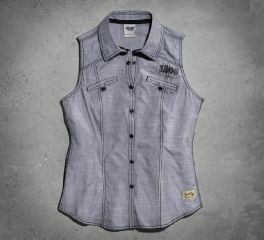 H-D's selection of women's sleeveless shirts the epitome of casual elegance for when the temperature rises. Shop for yourself or for an official Harley-Davidson® gift. Harley-Davidson® Women's Laced Back Sleeveless Shirt is made from 100% rayon. It features a playful velvet lacing and rich flocked graphics. Zipper front, and grommets on back. Inspired by courage and dedicated to those affected by breast cancer, our Pink Label Collection symbolizes strength and a passion for the cure. A portion of every sale is donated to organizations that support breast cancer patients and their families. The classy Eagle Snap Front Shirt takes you from this season into the next. Note the powerful soaring eagle with a raw-edge treatment. The contrasting stitching on this women's sleeveless top adds another dimension of style.